There are many great titles to choose from in this month’s Scholastic ﬂyer, but one particular collection stands out! While the weather continues to be that certain kind of unpredictable that can best be described as “mid-Atlanticish,” the trajectory is aiming for colder temperatures, and, if the predictions are correct, loads of snow. 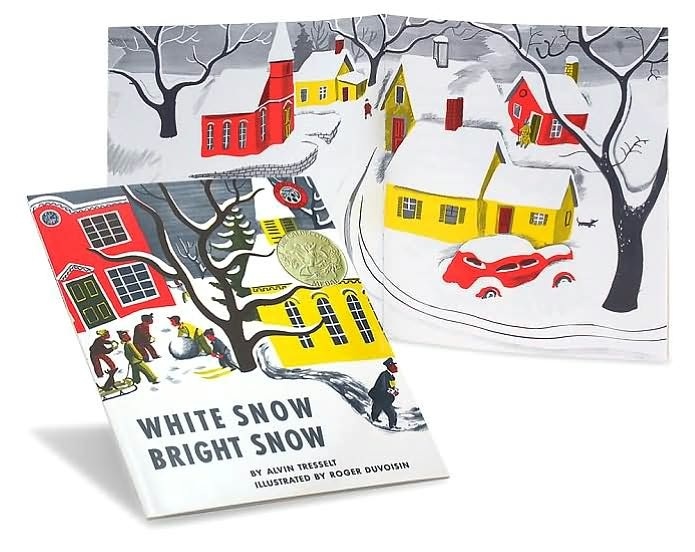 In anticipation of snowy weather that may or may not arrive (“mis-Atlanticish”, after all) Scholastic has grouped two classic titles in their Caldecott Snow Pack: Ezra Jack Keats’ The Snowy Day and White Snow, Bright Snow by Alvin Tresselt and illustrated by Roger Duvoisin. For most parents, A Snowy Day needs no introduction. A mere glimpse of a moment in Peter’s day and the story reveals itself again, years later. One remarkable quality of The Snowy Day is how it captures the pleasures of childhood solitude, the magic moments when all a child needs is whatever is there. and clear blue shadows hid in all the corners. Automobiles looked like big fat raisins buried in snowdrifts. The Caldecott Snow Pack is available for 5.99 during the month of November.